Trees are important in cities for many reasons – they look nice, provide shade, clean the air. But have you ever stopped to think about who takes care of the trees? Sometimes they need a little tender loving care, and sometimes they need someone to advocate for them – that’s where Tree Pittsburgh comes into the picture. Tree Pittsburgh is a non-profit organization that you need to know about. Tree Pittsburgh was started in 2006 (it used to be called Friends of the Pittsburgh Urban Forest). 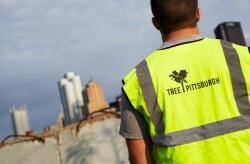 Tree Pittsburgh runs several programs to care for existing trees and to plant more trees in the city of Pittsburgh. Tree Pittsburgh also runs the Tree Tender program and has trained over 1300 Pittsburghs to help take care of our locat trees. The next Tree Tender Class starts on Saturday, February 22, 2014. Details and registration are available here. The national non-profit ACTrees (Alliance for Community Trees) has just posted an interview with Tree Pittsburgh’s executive director -Danielle Crumrine. The interview highlights Pittsburgh’s Urban Forrest Master plan and how other cities can develop their own plans. ACTrees: What exactly is an Urban Forest Master Plan? DC: An Urban Forest Master Plan is a road map, providing detailed information, recommendations, and resources needed to effectively and proactively manage and grow a city’s tree canopy. More importantly it provides a shared vision for the future of the urban forest to inspire and engage stakeholders in the care and protection of trees.